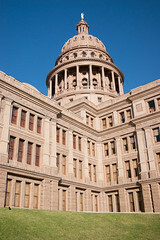 The 83rd Texas Legislature is in session, and water is on the minds of some lawmakers. As mentioned in the new issue of txH2O, establishing funding mechanisms for implementing the state water plan has been discussed by some legislators. HB 4: “Relating to the creation and funding of the state water implementation fund for Texas to assist the Texas Water Development Board in the funding of certain water-related projects.” Rep. Ritter, primary author. HB 11: “Relating to the appropriation of money from the economic stabilization fund to finance certain water-related projects.” Rep. Ritter, primary author. HB 178: “Relating to exemption from the sales tax for certain water efficient products for a limited period.” Rep. Larson, primary author. HB 227: “Relating to the appropriation of money from the economic stabilization fund to be used for the purposes of the water infrastructure fund during the next state fiscal biennium.” Rep. Larson, primary author. HB 449: “Relating to restrictions on xeriscaping by property owners' associations and certain political subdivisions.” Rep. Dukes, primary author. HB 752: “Relating to the types of entities that are considered municipal water suppliers for purposes of the law governing the effect of the subdivision of certain land on certain irrigation water rights.” Rep. Longoria, primary author. HB 1173: “Relating to a credit against the ad valorem taxes imposed on property on which certain water conservation systems have been installed.” Rep. Anchia, primary author. HB 1182: “Relating to energy and water management planning and reporting by state agencies and institutions of higher education.” Rep. Kacal, primary author. HB 1189: “Relating to interstate cooperation to address regional water issues.” Rep. Larson, primary author. HB 1307: “Relating to rates for water service, to the transfer of functions relating to the economic regulation of water and sewer service from the Texas Commission on Environmental Quality to the Public Utility Commission of Texas, and to the duties of the Office of Public Utility Counsel regarding the economic regulation of water service.” Rep. Geren, primary author. HB 1460: “Relating to the use of land and water for wildlife management.” Rep. Gooden, primary author. SB 4: “Relating to the administration and functions of the Texas Water Development Board.” Sen. Fraser, primary author. SP 22: “Relating to the administration of the Texas Water Development Board; making an appropriation from the economic stabilization fund to finance certain water-related projects.” Sen. Fraser, primary author. SB 198: “Relating to restrictive covenants regulating drought-resistant landscaping or water-conserving turf.” Sen. Watson, primary author. SB 224: “Relating to the availability of money from the economic stabilization fund to be used for the purposes of projects in the state water plan.” Sen. Seliger, primary author. SB 235: “Relating to the creation of regional authorities for water infrastructure projects.” Sen. Fraser, primary author. SB 272: “Relating to water well recordkeeping and reporting requirements, including the production, use, and withdrawal of groundwater. Sen. Seliger, primary author. SB 302: “Relating to the management, operation, rulemaking authority, and oversight of groundwater conservation districts.” Sen. Seliger, primary author. SB 342: “Relating to exemption from the sales tax for certain water efficient products for a limited period.” Sen. Estes, primary author. SB 567: “Relating to rates for water service, to the transfer of functions relating to the economic regulation of water and sewer service from the Texas Commission on Environmental Quality to the Public Utility Commission of Texas, and to the duties of the Office of Public Utility Counsel regarding the economic regulation of water service.” Sen. Watson, primary author. SB 589: “Relating to the designation of certain river or stream segments as being of unique ecological value.” Sen. Hegar, primary author. SB 662: “Relating to the composition of the drought preparedness council.” Sen. Carona, primary author.